Bang. Bang. 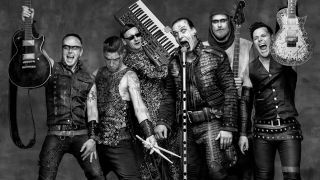 The mighty Rammstein return to the cover of Metal Hammer for a world exclusive interview! We get to the bottom of those break-up rumours, plus find out about their bonkers new movie, the plans for their new show, and their new album. You won’t get this interview anywhere else. In their ONLY interview, we talk to the German metal megaweights about those break-up rumours, their new show, their bonkers new movie… and the new album! You asked, and we heard you – which is why this exclusive, giant Iron Maiden poster is one of THREE free gifts in this issue! We’re also packing an exclusive Avenged Sevenfold poster, a free Hellyeah album and a free global metal CD boasting 15 fresh slices of heavy from around the world. Plus, ahead of their headline set at Download festival, we catch up with System Of A Down for a brand new interview! We also head to Megadeth legend Dave Mustaine’s house and go camping in his garden. No, really. This happened. Deftones hit the UK this week, so we reveal the amazing, untold stories behind their incredible second album, Around The Fur. It involves McDonald’s. The new Malevolence album is blowing our speakers up – we ask how five pissed off kids from Sheffield became one of the UK’s most promising metal bands. And we delve inside the seminal 90s Gothenburg metal scenes and chat to its architects about its legacy. We also find out why Papa Roach have fully embraced the rapping again – and if they’ve made Infest 2.0. We go backstage at Beartooth’s US tour with Bring Me The Horizon. We delve into the heartache that shaped Northlane’s masterful new album, Mesmer. We discover the ethos that helped Power Trip make one of the best thrash albums of the last 20 years. We get the story behind Alter Bridge’s hallmark anthem, Metalingus. We raid WWE Superstar Baron Corbin’s CD collection. The new issue of Metal Hammer is in stores now and is available to order online. You can also subscribe to Metal Hammer so you never miss an issue.